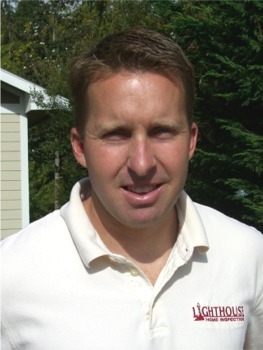 Serving Kitsap, King, Mason, Jefferson, and Pierce counties, Scott DeSchryver is a Licensed Home Inspector and Pest Inspector in the State of Washington. He has performed over a thousand inspections giving him the experience and knowledge to provide the most thorough and accurate home inspection service available. Lighthouse Home Inspection, LLC is a referral based company that relies on customer satisfaction for its success. By adding his technical education at a Better School of Building Inspection in Salt Lake City, his knowledge, skills and experience work together to deliver a superior home inspection. Dedicated to honest and impartial inspections, Scott works for the home buyer, not the realtor. His mission is to educate his clients about the home they are considering, from major problems to preventative maintenance issues. Scott’s attention to detail, accurate reporting and personal explanation of his findings help eliminate the stress of the home buying process. Let Scott help make your home buying experience less stressful, and give you peace of mind that your new investment is a sound one. about our home inspection services.